The FW312 in one word is EASY. It is designed to make the most accurate splice possible. It comes factory-programmed with six of the most common splice profiles and storage space for fourteen additional. A crisp 45 x magnification view with 25 micron markers makes the fibers clearly visible before, during, and after the splice. The FW312 displays instant results to the installer after the splice... the job is done and done right the first time. Since the FW312 is fully programmable, splicing is at last "one button easy." That's what Aurora calls performance. The FW312 is tough and reliable, with the ability to work inadverse conditions, like humidity and extreme temperatures. It also has multiple coice for power, including a standard built-in NiCad battery. 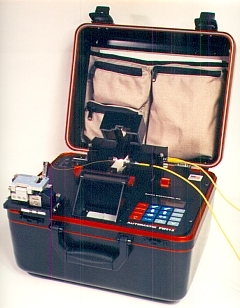 Inside a solid sealed case is a highly durable, microporcessor controlled, LID fusion splicer that has been proven versatile under the widest variety of fiber and splicing conditions. A transit case completes the package. Aurora makes reliable equipment and packs it for tough jobs. Take off into the field with one hand free. A look at thepicture will show how compact and self-contained the FW312 is with tools and accessories. The case is sealed against moisture, the top is removable, the cleaver pivots to make it easy to work and simple to store, and the fiber can be loaded into position in just seconds even after a long day under the most miserable conditions. We have considered where and when the installer must take our splicer and made it the product of choice for people who know.